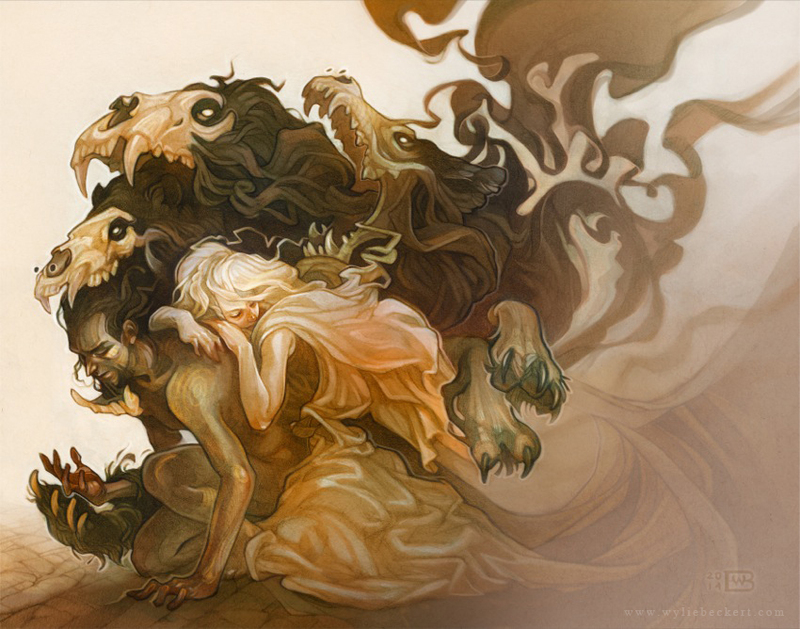 Image “Tam Lin” by Wylie Beckert. Used with permission Please click on image to visit her portfolio. Since I first became acquainted with the story of Tam Lin (or Tamlin), I’ve run across some different iterations of the tale in song and prose (to see the Child Ballad  in full, go here). Essentially, the story runs that Janet, a well-to-do but lonesome and rebellious young lady, sets off one day on her own to Carterhaugh, where she longs to be, despite the warnings of her father or parents. Once there, she offends Tam Lin by plucking roses, and after a little row between the two over this in which Janet asserts her rights to Carterhaugh and general independence, the two become lovers. The result, naturally, is that Janet, as her father suspects, becomes “with child.” But how can she love this baby, begot in such an unnatural way? She returns to Carterhaugh and declares to Tam Lin that she won’t bear the child, but that if it were a fully human baby, fathered by a man and not some otherworldly being, she would love and cherish it. Tam Lin then reveals that he once was human, before he was abducted by the fairy queen, and that this Halloween she may be sacrificing him as a “tithe to hell.” On the other hand, he tells her that if she can wait in secret until the fairy procession arrives on Halloween night, pull him from his white steed, and hang onto him as he turns into all manner of frightening creatures in her arms, that he will again, at the end of the ordeal, be a man, and she will be able to love him, and their child. Janet, of course, succeeds in this rescue. Afterwards Tam Lin reverts to a “naked man,” and Janet wraps him in her cloak and takes him home to be her true love. I don’t want to analyse the images in Tam Lin too much, but rather let them continue to work in me as they have done since I first discovered the story. There are many elements of the tale I find compelling, including Janet’s defiance of her family, and following of her impulse–I don’t see this necessarily as healthy rebellion mind you, but I rather sense it as a giving in to what begins as an unhealthy longing or obsession, as when we do something rash out of loneliness and/or temptation that might end very badly. But this is a redemption story, and what is most touching to me is Janet’s bravery in not letting go as her fairy lover shapeshifts into multiple terrifying creatures. Says, Adieu to thee, Tamlene! And put in a heart o stane. The following rendition of the ballad, for me, while leaving out the fairy element of the rescue plot, captures the soul of the story of Janet and Tam Lin. Enjoy!